Dropped off new to me 911 at Sleepers Speed Shop this week. Will know this week if we will be going beyond top end job. Heads will be off today. I'll post a few pics as engine come out and build begins. Comments please on "I wish when the motor was out I would have" ___________, ________ and ___________. I dont have an unlimited budget on this build as its a driver build so please keep that in mind. Engine out, heads off and at machine shop. With Heads off it was clear new P&Cs would be part of the build. Lower inspection showed/looked great after inspection so engine builder will replace a few seals and button her up shortly with the new Mahle 3.2 P&C and valve job. Coating fan, shroud, valve covers and a few more bits. Stock exhaust going back on after cleanup and fresh coating. All new hardware and gaskets of course. While engine is out new engine sound pad, rear shocks, sway bars bushing going in. Hope to have a few picks posted soon. Last edited by 996AE; 10-05-2018 at 01:47 PM..
Congrats! I'm on a similar course with an 88 Targa. 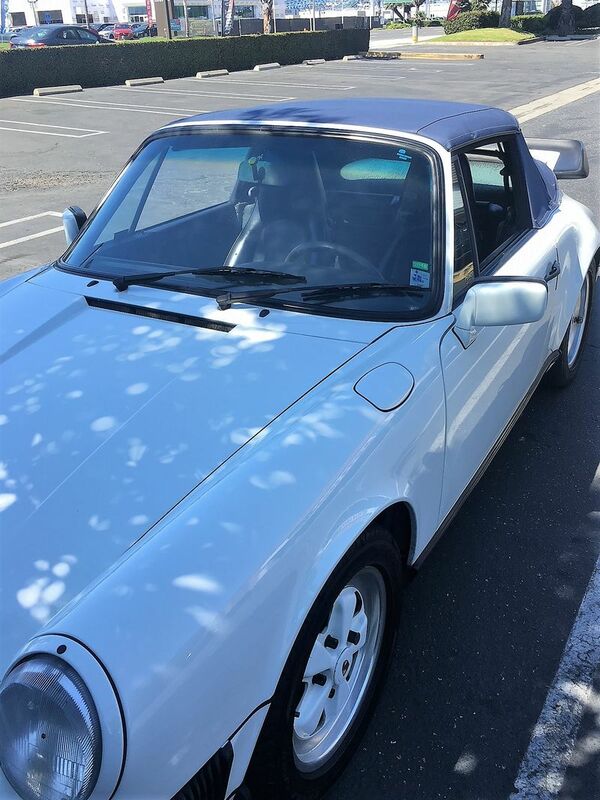 You can check my thread for similar question I asked for My new journey with an '88 911 Targa! Your problem, I would guess, will be passing smog, so you are fairly limited in your options. Since you need pistons and cylinders you can update to 98mm P&Cs giving you a 3.4L. Probably could use 964 cams and an updated chip as well. Maybe search for Draco's (DRACO A5OG) recent rebuild. Last edited by Trackrash; 10-05-2018 at 08:35 PM..
Keeping car 100% stock so 3.2s Mahle going on with JE pistons. No chip for this cab driver. Any while your in there suggestions? Last edited by 996AE; 10-06-2018 at 06:57 AM.. Sleepers Speed Shop engine builder had plans to just re ring and valve job. Said after heads came off the type of factory cylinders I have from Porsche will smoke even with new rings. Recommended we replace. I am meeting with them tomorrow to learn more on why the cylinders cant be reused as originally planned. I know more tomorrow and will post what I learn. Shop confirmed aluminum cylinders from Porsche on the 88 911 arent good for re ringing. So, I bought the Mahle 3.2s. Down the slippery slope I went. We are going to split the case and replace bearings and do a reseal. Last edited by 996AE; 10-13-2018 at 10:23 AM.. Heads are off and at machine shop. Bottom end split next week all new bearings and reseal. SSS said it was another 2k for the 3.4 Mahle. Had to draw the line somewhere. Tins, fan, housing, strap and valve covers off to powder coat shop. OEM 930 whale tail coming off and new Carrera deck lid will replace it. Tail is for sale. Grand Prix white 908 paint code. Cleaning up exhaust system. Trying to keep it stock for now but the huge muffler and weight is causing me to rethink this. Any recommendation on a muffler. I can weld so I was thinking a Magnaflow uni one in one out and fab up the pipes. Last edited by 996AE; 10-18-2018 at 08:14 PM..
they are K&S and not Mahle i think. Didnt recommend bore and coat Alusil. As a non mechanic type other than DYI oil, brakes, spark plugs and suspension stuff engine build not my thing. I relied on my engine builder. Pelican Parts supplied Mahle 3.2 P&Cs new going in. Last edited by 996AE; 11-03-2018 at 09:26 AM..
K&S are alusil, right ! Mahle are Nikasil, the best !!! if you intend to pitch your alusil jugs, can i ask what you'd send them to me for? PM is great. Excited to get her back on the road and cleaned up a bit. I'll be doing the suspension, brakes and interior refresh as soon as shes running again. Awesome! Going to be a really nice car when you are done.